The patient was a 48 year old man who presented with a three week history of back pain, progressive right leg weakness and bilateral lower leg numbness. Three days before admission he experienced a few episodes of urinary and bowel incontinence. 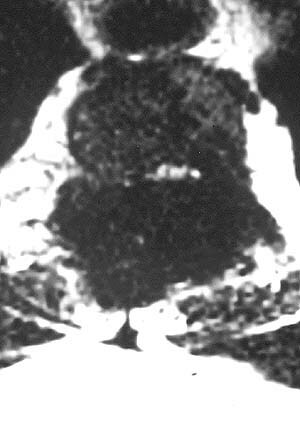 His past medical history was significant for end stage renal disease managed with hemodialysis for 8 years, a failed cadaveric renal transplant three years before the current admission, secondary hyperparathyroidism with osteoporosis, and hepatitis C.
Examination showed 4/5 motor strength of the leg muscles bilaterally, absent reflexes in both lower extremities and a sensory level for pain and temperature at the level of the T12 dermatotome. Examination of his mental status, cranial nerves, proprioception, coordination and upper extremities strength and reflexes were normal. His general physical examination was otherwise unremarkable. A CT and MRI of the spine were performed. The patient underwent a posterior thoracic laminectomy of T2 and partial laminectomy of T1 and T3. Grossly the cortical surface of the T2 spinous process and lamina appeared normal in texture and color, however, they were clearly enlarged compared to adjacent levels. Removal of the spinous process revealed that the cortical bone was very thin and the cancellous bone has been replaced by soft, dark brown and fibrous tissue. This bone was easily removed with a curette. After laminectomy the spinal cord was well decompressed. 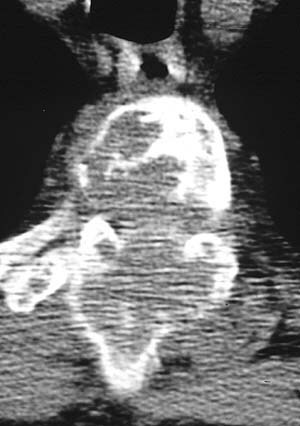 The thecal sac at the level of T2 had a golden-yellow discoloration. Immediately post-operatively the patient noted in his sensation and lower extremity strength. Three months after surgery he is ambulating at his neurological baseline. MRI and CT examinations were performed on the cervical and thoracic spine. The MRI demonstrated a markedly expanded spinous process (Image 01, Image 02) and lamina of the second thoracic vertebra (T2), which was of low signal intensity on both T-1 and T-2 weighted images, being more marked on the T-2 weighted images. 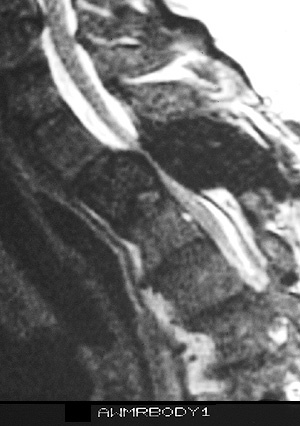 The T2 vertebral body was enlarged and expanded posteriorly into the spinal canal causing marked spinal cord compression (Image 01, Image 02). The CT of the T2 vertebra (Image 03) revealed an extensive destructive lesion of the spinous process, lamina and vertebral body.. In addition other vertebral bodies showed multiple variable sized foci of bone destruction.